San Marino is one of the smallest countries in the world. It is found in southern Europe and is fully surrounded by Italy (this is called an enclave, and only the Vatican City, Lesotho and San Marino are like this). Fewer than 30,000 people live there. Its total area is 61 km2. Its capital is the City of San Marino. San Marino is the world's oldest republic that still exists. 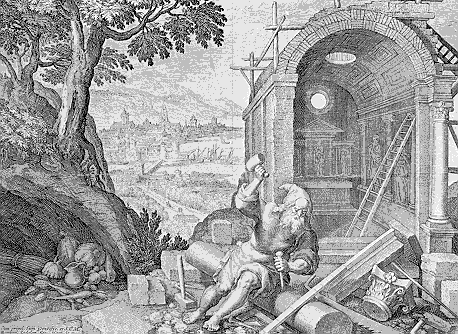 It was started in A.D. 301 by a skilled builder called Saint Marinus. 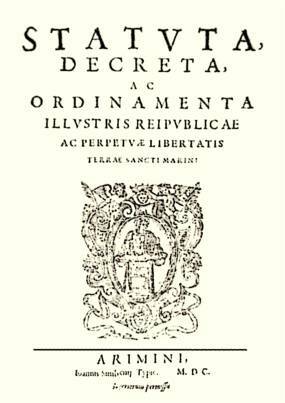 Its written constitution was adopted on October 8, 1600. The very small nation was recognized by Napoleon's France in 1797, and by the other European nations at the 1815 Congress of Vienna. Even though it is an independent country, it depends very much on Italy. Since the 19th century, when Italy was unified, San Marino has been fully surrounded by Italy. 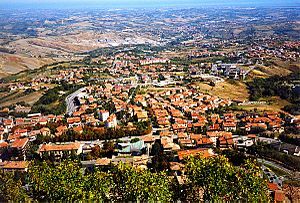 The biggest industry in San Marino is tourism. Selling postage stamps is an important source of income, too. 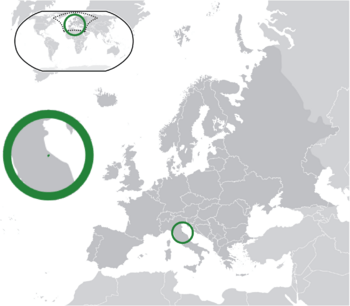 San Marino is not a member of the European Union, but the euro is used in San Marino. People in San Marino speak the Italian language. Most people in San Marino believe in Roman Catholicism. San Marino is covered by the Apennine mountain range, and it has a rugged terrain. The highest point in the country is Monte Titano. There are no bodies of water of any significant size. San Marino has no natural level ground. It is hilly terrain. San Marino is the third smallest country in Europe, Only Vatican City and Monaco are smaller. Two rivers flow through San Marino. There is no major water transport, and no major port or harbour. 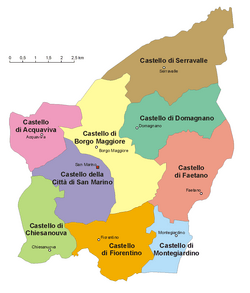 The cuisine of San Marino is strongly similar to Italian, especially that of the Emilia-Romagna and Marche regions. It has a number of its own unique dishes and products. Its best known is probably the Torta Tre Monti ("Cake of the Three Mountains" or "Cake of the Three Towers"), a wafer layered cake covered in chocolate. It shows The Three Towers of San Marino. The country also has a small wine industry. 1 January New Year's Day Festival marking the beginning of the new year. 6 January Epiphany Commemorates the visit of the three Wise Men or magi to the infant Jesus. 5 February Feast of Saint Agatha Commemoration of St. Agatha, Patroness of the Republic, as well as liberation from foreign rule. variable * Easter Resurrection of Jesus. variable ** Easter Monday Monday after Easter day. 25 March Anniversary of the Arengo Anniversary of the Arengo and the Festa delle Milizie (Feast of the Militants). 1 May Labour Day Celebration of workers and employees. variable *** Corpus Domini Commemoration of the body and blood of Jesus Christ. 28 July Liberation from Fascism Commemoration of the fall of the Sammarinese Fascist Party. 15 August Ferragosto (Assumption) Commemoration of the Virgin Mary's direct assumption into heaven upon her death. 3 September The Feast of San Marino and the Republic National feast of San Marino, celebrating the origin of the Republic in 301. 1 November All Saints' Day Feast dedicated to all saints. 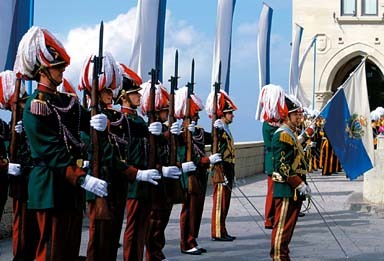 2 November Commemoration of all those who died at war Remembrance of all those who gave their lives for San Marino in war. 8 December Immaculate Conception Remembrance of the Virgin Mary's conception without original sin. 24 December Christmas Eve Day before the commemoration of the birth of Jesus. 25 December Christmas Birth of Jesus. 26 December St. Stephen's Day Commemoration of the death of Saint Stephen, the first Christian martyr. 31 December New Year's Eve Celebration which closes and marks the end of the year. The front passes Monte Titano in September 1944. 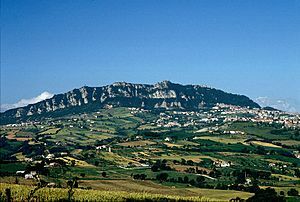 The fortress of Guaita on Mount Titano. Palazzo Pubblico is the seat of the government of San Marino. Four former Captains Regent: from left to right, Mirko Tomassoni, Alessandro Rossi, Alessandro Mancini, and Alberto Selva. Tourism, together with banking, is the country's main source of revenue. A painting in the Museo di Stato di San Marino by Pompeo Batoni. 2005 San Marino Grand Prix held in Imola, Italy. San Marino Facts for Kids. Kiddle Encyclopedia.